Hamilton, New Zealand, 16 July 2018. A sub seasonal and seasonal forecast updated every ten days can be very helpful when monitoring an evolving El Niño. Last week an El Niño watch was released with the regular ENSO update by the NOAA Climate Prediction Center. While ENSO neutral conditions were expected through our southern hemisphere winter as spring emerges there is a forecaster consensus that El Niño conditions are likely to evolve. 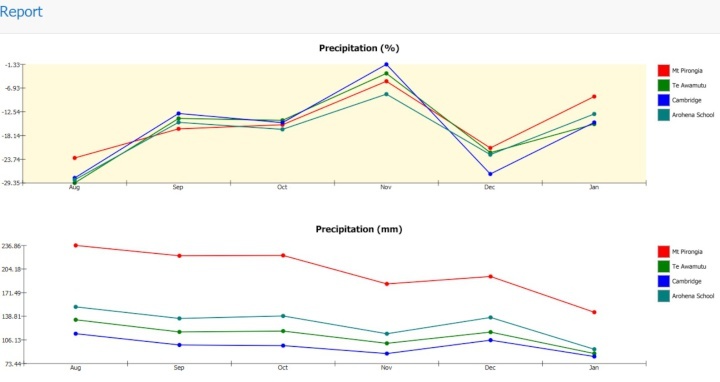 The forecast from ExtendWeather brings an ensemble of 40 runs of the CFSv2 sub seasonal and seasonal forecast to the fingertips of those interested in potential month by month changes in key variables such as rainfall, temperature and potential evapotranspiration. 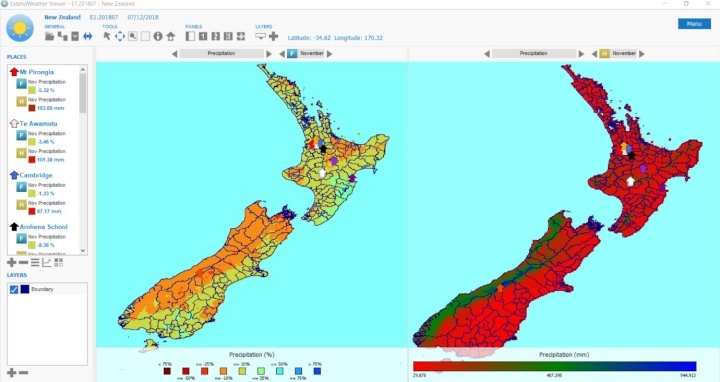 The ability to set up the ExtendWeather viewer for specific sites of interest (farm, construction site, forestry block, orchard, vineyard) and the quick and easy access every ten days to the latest updated forecast information is unapparelled in the country. The team at ExtendWeather focus on the ten-day updates as model runs do change. The forecast released at the start of each month can be very insightful as to the potential trends for that month. But you can also look out across several months and watch as the forecast evolves with each update. The forecasts are also archived so you can easily go back and look at previous forecasts. As an El Niño event is now possible how it could impact on New Zealand is of concern to both primary producers and markets. ExtendWeather is part of a larger weather, sub seasonal/seasonal and climate risk forecasting, modeling and consulting group at CLIMsystems Ltd. Our team has developed innovative products and services for application around the world. If you would like more information on this topic see the website www.extendweather.com or call Soumik on 022 132 0438. ExtendWeather maps that are updated every ten days and user defined site-specific results displayed. Reports for anywhere from one to nine months of seasonal forecasts for user defined sites are easily generated and exported.